Water is wonderful until it appears in mind-boggling quantity in the wrong place. For instance, pouring out of the ceiling onto the new carpeting downstairs in your house. There’s that first moment of incredulous unbelief, accompanied by an exclamation of horror, “what is happening here!” Contact occurs. You step in that alarming dark spot. It squishes. The dark spots flow right through that room and into the next. This can’t be happening. Oh yes it can! Go back a week or two to discovering another place where water was most definitely not supposed to be; that strangely green patch in a sea of dead lawn (brown IS the new green!). Mike Partain, our go-to guy whenever we need anything plumbing related, came as quickly as he could, dug a hole about 4’ deep and 4’ wide, exposing a galvanized pipe which was cracked and leaking water at an alarming rate. He capped it, came back with his son on Saturday, dug trenches through the rose bed, under the path, and all the way to the garage. Installed a mile of PVC pipe and pronounced us good to go. Peace reigned. Water, that turbulent force, was controlled and contained again. Then came Monday and the aforementioned water pouring from the ceiling. Mike came back, revealed another cracked galvanized pipe in the ceiling spraying water in all directions with gay abandon. He capped the pipe and speaking in calm tones, such as one would use with an hysterical toddler who has lost her blankie in Target, told us that the galvanized pipe which was installed when our house was new back in 1916 is all ready to blow. New pipe will have to be installed wherever water flows. The galvanized pipe will be abandoned in the walls and life will go on. We looked at each other, my joint tenant, John, and I, and said, “oh.” Mike left us blotting up the water soaking the carpet. We used every towel in the house, blotted and blotted and here it is Wednesday and I’m still blotting. There’s a system now, though. 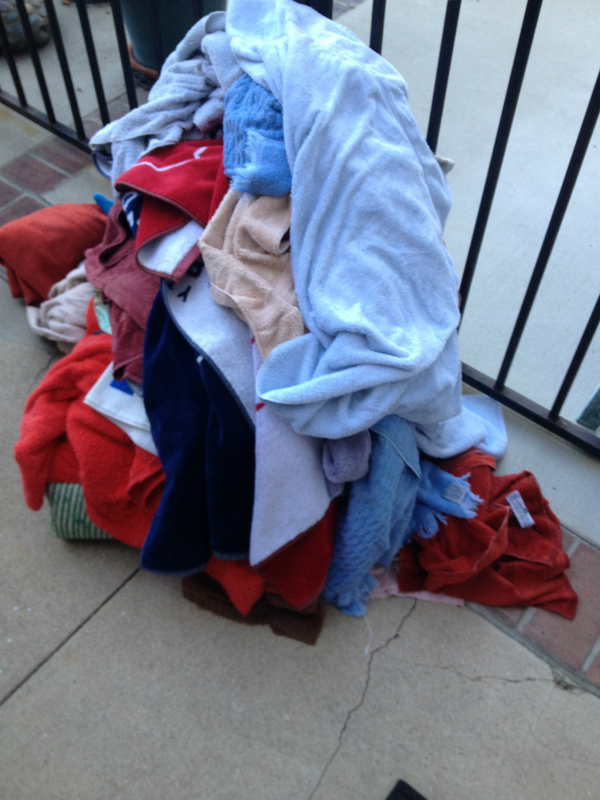 Blot till towels are soaked, put that bunch in the dryer. Use the group 2 towels to blot till towels are soaked. Repeat process. The carpet may live through this. We’re pretty sure we will, too. Our house is happy as it’s getting another improvement. The rooms have heard much laughter, anger, sorrow, joy and tears. Replaced a thousand window screens. Re-papered it, repainted a dozen different color schemes. Earthquake cracks run down the walls and we need to paint the hall. The house we live in, John and I, has stood almost 100 years. We know that God has blessed us, that He's given us this home. That He's filled it with His presence, His joy and love and peace. Yes, even though the galvanized pipe is giving way all over the place, we can find the blessing there. We leave for Texas soon and we are thankful that this happened before we left in enough time to deal with it. We are thankful that it didn’t happen while we were gone. That’s too hideous to even imagine. We see God’s hand in our lives everywhere we look. “God hath not promised, skies always blue.